This was another great day, though relatively short. I was so tired that I chose to sleep in, even though it mean missing Louise Cuttings 8:00 class. Her One Seam Pants pattern has always intrigued me and I thought I’d check it out. But it will have to be another time. So I slipped in to Connie Palmer’s class Connie’s Techniques & Notions Know-How – Take your sewing up a few notches by learning the favorite techniques and notions that are Connie’s favorites when she creates her sewing masterpieces. You’ll see how she uses notions; whether “tried and true” or the “new kid on the block,” you’ll learn how to make each and every technique easier and with perfect results every time. ..
WOW! Connie scopes out all the latest notions and then applies them to her dynamite techniques. She creates more beautiful things in less time than anyone I know. As this blond whirlwind said, when she sews, she likes to GO! And not stop to wait for something to dry or to spend time calculating the distance between buttonholes. Spaghetti bias is so big right now and Connie is all about it. 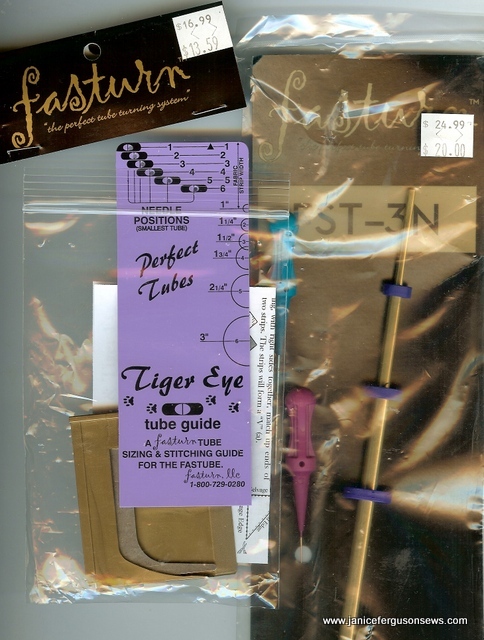 Fasturn Tubes have been around for a long time, but it took Connie’s samples and tips for me to board that bandwagon. Of course, in her insistence on perfect everything, she has embraced the Fasturn Tiger Eye. It sounded good when she described it, though I wasn’t at all sure how it would work. But I bought it. Like the majority of people, I am a visual learner. I found this very clear, succinct instructional video on YouTube that shows exactly how to use this valuable little tool. 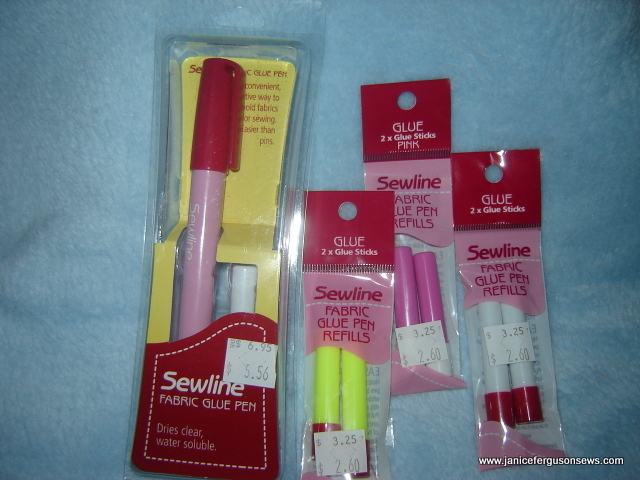 The Sewline Fabric Glue Pen was at the top of Connie’s list of MUST HAVES. It leaves a fine line of glue in blue, red/pink or yellow but it dries clear. Connie advised everyone in class to purchase the pen and refills in every color right after class, because she felt sure Martha would sell out. And she did, after I got mine! She was asked the obvious question–why do we needed different colors if it dries clear? Because the line is so fine that you may not know where it was applied if you have blue glue on blue fabric. So there are different colors so you can be sure to achieve the necessary contrast for accurate placement. Next question, why do we need a Sewline Fabric Glue Pen? There are lots of applications, but the one that impressed me most was its use for bias lace cathedral windows. Connie traces the placement lines for the spaghetti bias window, then places her lace and bias exactly where she wants it. Tip: outline only a few inches at a time because this dries quickly. Connie also noted that the glue is water soluble and does not gum up the sewing machine needle. Great stuff. I found a nice tutorial on using the glue pen for English paper piecing. That’s not my thing, but it made me realize that there are so many ways this pen can be used. Clover’s Fabric Folding pen is another of Connie’s favorites for her speed sewing style. It is faster and makes a crisper fold than finger pressing and/or going to the iron. Next was Linda McGehee‘s zipper class. Forewarned, I settled in for some heavy duty note taking. 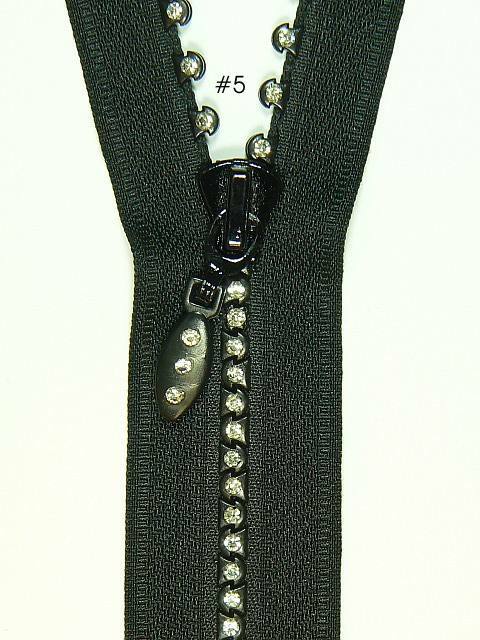 Zippers – Easy, Fast, and Fun – Tired of being hidden and ignored, the zipper is exposed as a truly versatile embellishment. Let the zipper make a statement on your next project. Don’t use a zipper foot! There are new and different applications: Use zippers as trim, artwork, jewelry, and places that you never would have thought to use a zipper. Included are at least 5 easy ways to insert a zipper. 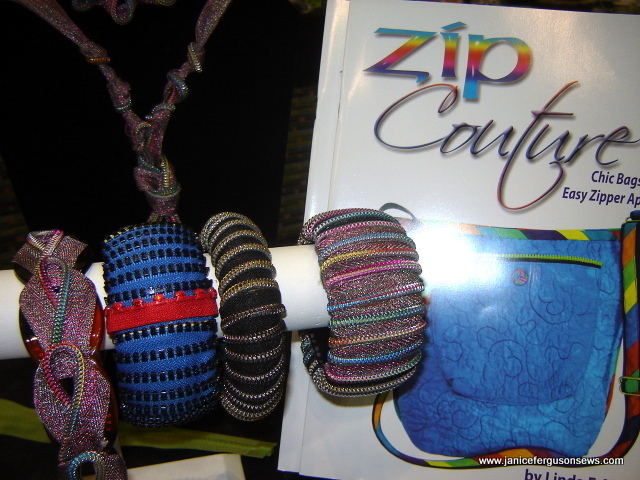 Come join Linda and learn new tricks with zippers…. But I was so enthralled that I took very few notes. Now, zippers and bling and fashion statements are just not my thing. But I am painfully aware that I need to update my taste, my presentation and my sewing direction. So far I’ve learned to like metallic thread, gotten a new haircut and bought hot fix crystals. That’s just a start, so I thought I should drop in and see what she had going. But my jaw was just on my chest most of the time and I forgot about note taking. Linda has done bags forever and continues to be on the cutting edge of fun and fashion with them. She has also branched out into fabric manipulation. Her current thrust is zippers, which she has embraced with her signature style of creativity and flair. Her samples were fun, bright, and so unique. This jacket evoked audible WOW!’s at the fashion show. The back was as attention getting as the front. The new zippers are not like the old metal toothed utility items. In a variety of tape colors, you can get rhinestone teeth. 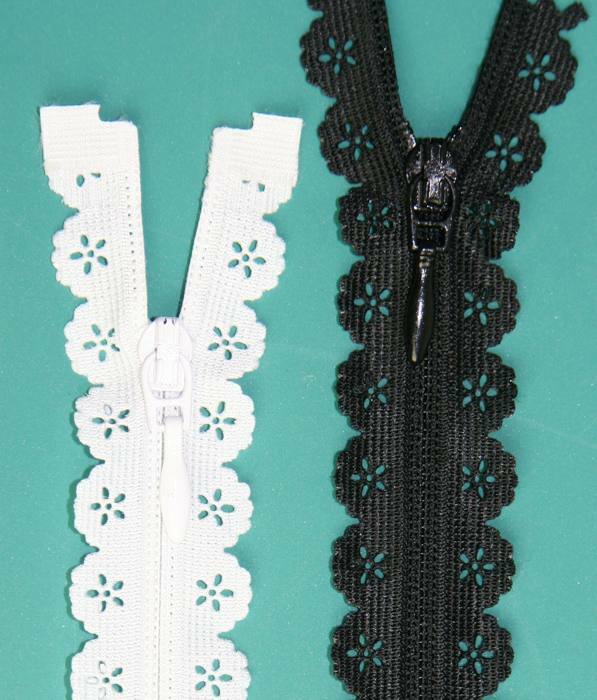 Or how about lace zipper tape? 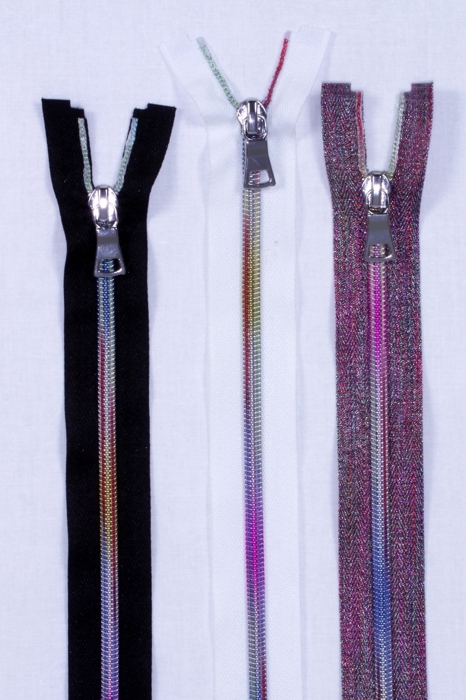 Iridescent rainbow teeth add an unexpected blast of color to any garment or bag. She even has camouflage zippers! But what was more amazing than the zippers is how she used them for everything from closures to jewelry. 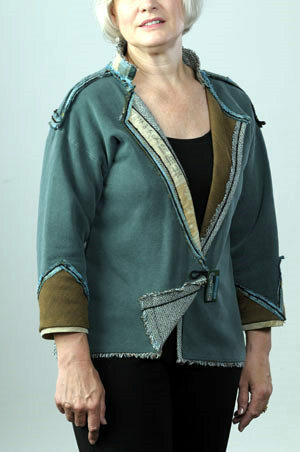 Because there is often left over zipper after insertion, Linda saves all those little pieces and used them for piping or trim on everything from a pocket top to a collar. Linda explained how some of the separating zippers can by mated to create a two-color zip. By purchasing two zippers in different colors, i.e. orange and blue, you can unzip them and put a blue side with an orange side. Think of the possibilities! On her web site, Linda has a free directions for making a pansy pin from a zipper. Check it out. 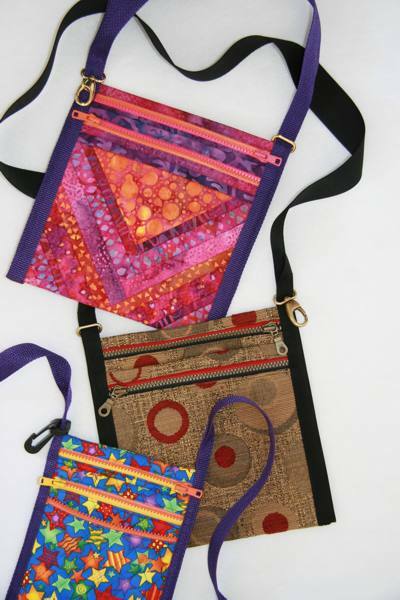 Lezette Thomason put her creativity to work with zippers on Children’s Corner pattens. Children’s Corner Jacqueline in black pique. 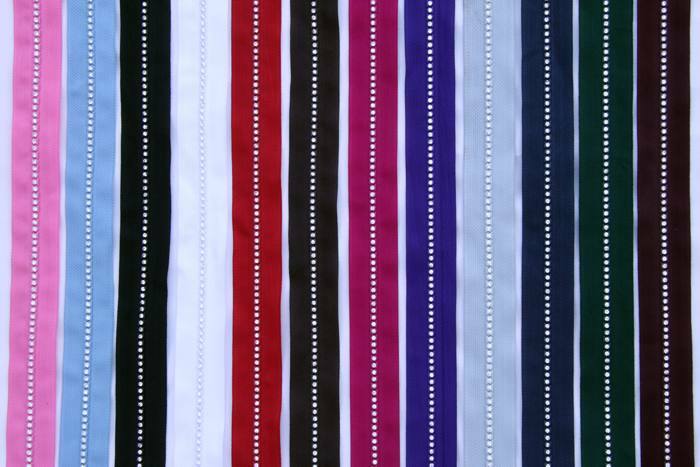 The yoke has been split in use two black and white prints embellished with black piping and white rickrack. The black and white separating zipper allows the bottom of the dress to be removed to create a tunic. 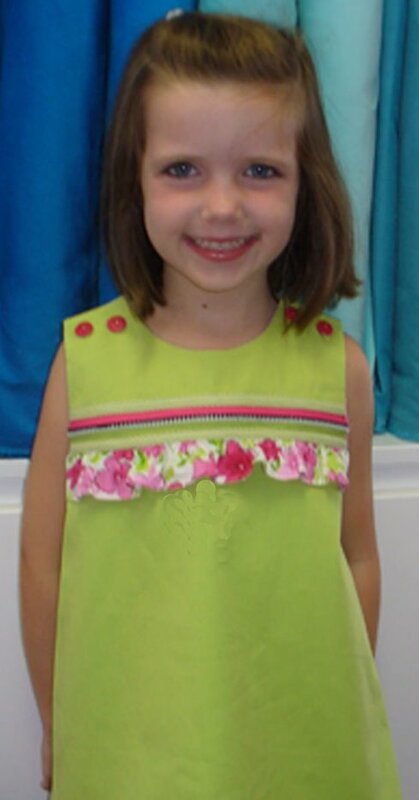 Children’s Corner Lucy in lime pique with a floral ruffle topped with a lime and pink zipper. Zipper edges are hidden with top stitched with lime gingham bias. I think this is Children’s Corner “Katie’s Skirt” pattern. So cute with the zippers and contrasting fabric. 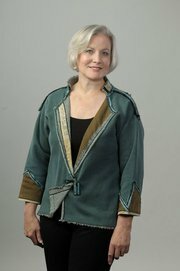 On to Londa Rohlfing’s class: Refined Embellishments for Creative Sewing – Learn tasteful embellishment of clothing to make it special, yet NOT overdone. 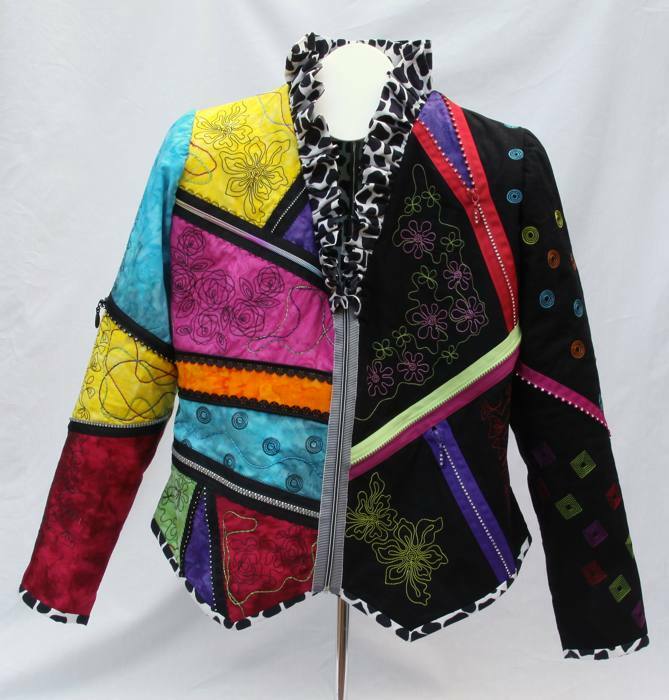 See numerous examples AND learn techniques for taking your clothing beyond what you normally expect in wearable art. Special emphasis is given to the myriad uses of bias, and many new sewing notions with embellishment potential are included. Many years ago, Londa and I both were teaching at Mildred Turner’s unforgettable Sewing in the Mountains. 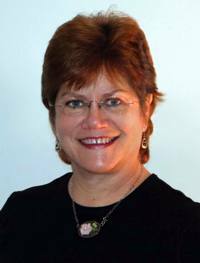 Londa’s style and flair were obvious from the moment I met her. Later, I taught at her store in Illinois and found that her beauty is more than skin deep. What she does to fabric, and especially sweat shirts is amazing. As I hope you can tell from the photo above, Londa’s creations are not cute Cracker Barrel style sweatshirts. She looks at sweatshirts as fabric yardage, largely because you cannot buy quality fleece in as many colors as are available in ready-to-wear sweatshirts. On some, she removes the bindings and continues from there. On others, she cuts away the sleeves and ends up with a front, a back and two sleeves. Then she proceeds to cut any style she likes from that yardage. With either approach, she ends up with stunning jackets. Londa couches every interesting fiber she can find, from the knit shops or any other place she finds interesting trims. 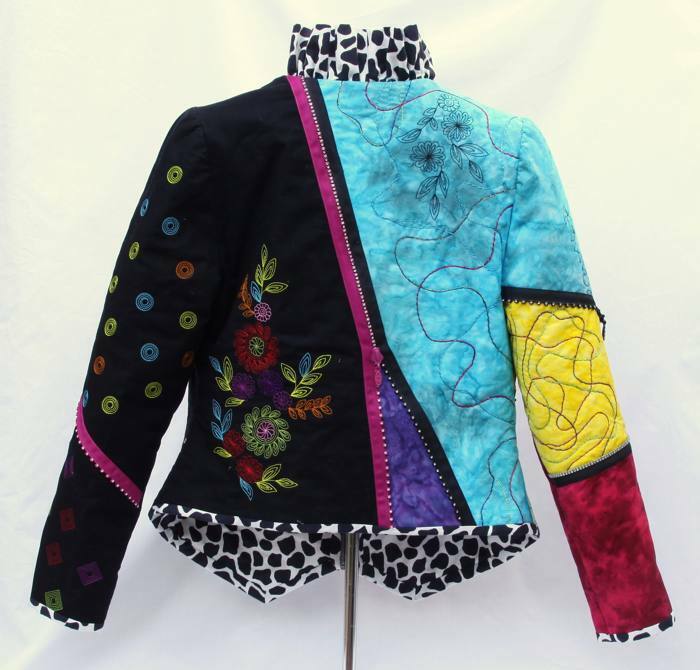 A look at the jackets on her web site offers a wealth of creative ideas. Her booth was filled with her jackets, but I could hardly keep my eyes off the beautiful details on the one she was wearing. She somehow manages to add so much embellishment, but not too much. This class gave me new inspiration for sewing for myself. As I said in an earlier post, it’s hard to say which was better, the vendors or the classes. Whatever. 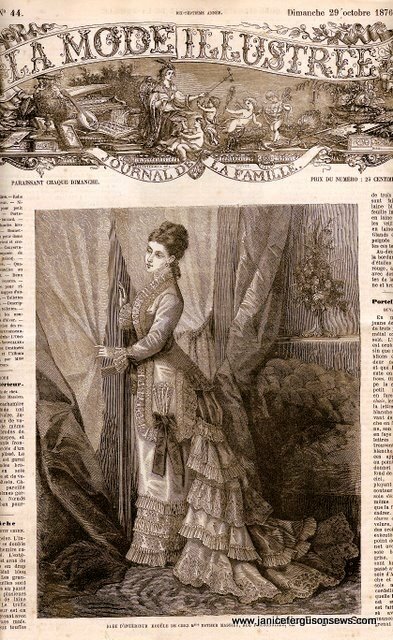 At Luc’s Lace booth, I found some pretty neat things while shopping, including a huge stack of antique (1876-80) French magazines. Each was only 8 large pages long, with just a scattering of needlework. 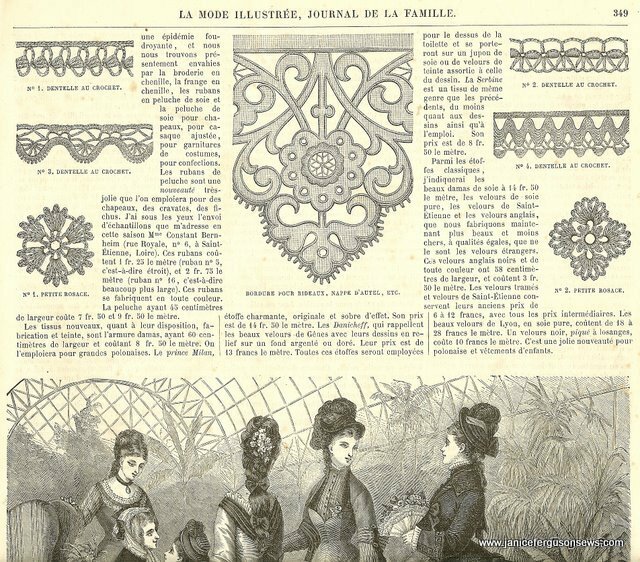 My French is not great but I didn’t need to know much to recognize this illustration of rick rack lace which was discussed in an earlier blog. After seeing this French publication, I did a little research and discovered more information. This was an especially pleasant purchase as I conversed (or tried to) with Luc’s elderly Dutch mother who spoke not much more English than I speak French. This very charming lady lives in France and either has had these magazines for 40 years or has been collecting them for the last 40 years. There is more, but this is just toooooo long. So I will leave you with this message: Don’t ever miss an opportunity to attend one of these sewing extravaganzas! 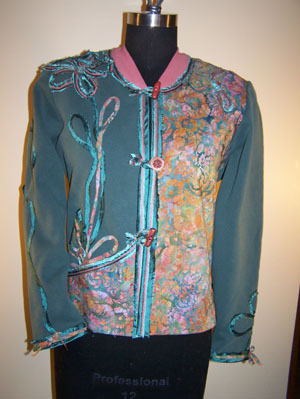 This entry was posted in uncategorized and tagged Connie Harbor, Linda McGehee zippers, Londa jackets, marthas sewing market, spaghetti bias. Bookmark the permalink. Hi, Janice. I have been occupied with my mother’s hospitalization and rehab since her fall on Dec 11. I feel that I have missed out on so much on your blog. I will be going back and reading all that you have shared about the MP market, etc. I know that you were greatly inspired by it. I am envious that you were able to soak up all that creativity of so many talented artists. 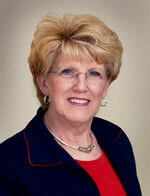 Beckie, I check your blog daily, hoping for a good report on your mother’s recovery. I hope your life returns to normal soon and you can get back to sewing.